Jennifer reviewed Horton over at 5 Minutes for Books and this personal post about the movie pretty much exists to add three cheers to everything she already said about the film. Horton Hears a Who can go on record as being the first full-length film watched and enjoyed by our small family - our son being 2 years old. Our son doesn't do scary movies and although we've attempted a few Disney Classics, we have found that anything dark in tone (colors) or sound (music) will be a sure flop. (Turning on The Jungle Book was one of the worst decisions we have ever made in terms of scarying our child senseless.) He gets too wrapped up in what he's watching. Thus far we have avoided movies but wanted to see Horton with or without him due to all of the positive press it has received. We decided to go ahead and watch this movie with our son based on Jennifer's recommendation and she will no doubt be glad to know that we were so glad we did! We laughed, hooted and hollered over this movie. It was funny. Very well done. The moment (and I do mean the very second) the movie was over, the kid looked over at us and asked, "Again!?" Horton was a hit! I don't want to get into an argument over schooling options and I sincerely wish that the movie hadn't raised any. I think Kangaroo was used to cast home schooling parents in a negative light which is indeed unfortunate. It did get my back up at the beginning of the film and I was wondering where the film makers were going to go with it. However! That one sentence was really all there was to it and nothing else was really said in reference to home schooling. It was the statement that left the bad aftertaste but you could choose to ignore it and enjoy the movie if you wanted to. I wanted to and so we moved on. Yes, it is bothersome and yes, as a home schooler, you'd probably want to know that that sentence is in there. However! It IS an enjoyable movie. It is funny. It is clean. It is cleverly done and is bright and colorful to boot! It sparks imagination and it isn't intense and scary. We LIKED this movie - a lot! 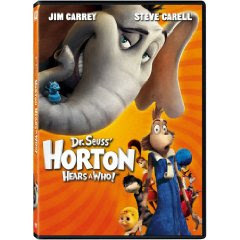 So I'm with Jennifer - if you want a relaxing film to enjoy during the holiday downtime, Horton Hears a Who is a winner!